A new programme celebrating the shared heritage of Rathlin Island, Ballycastle and The Glens will begin later this month. 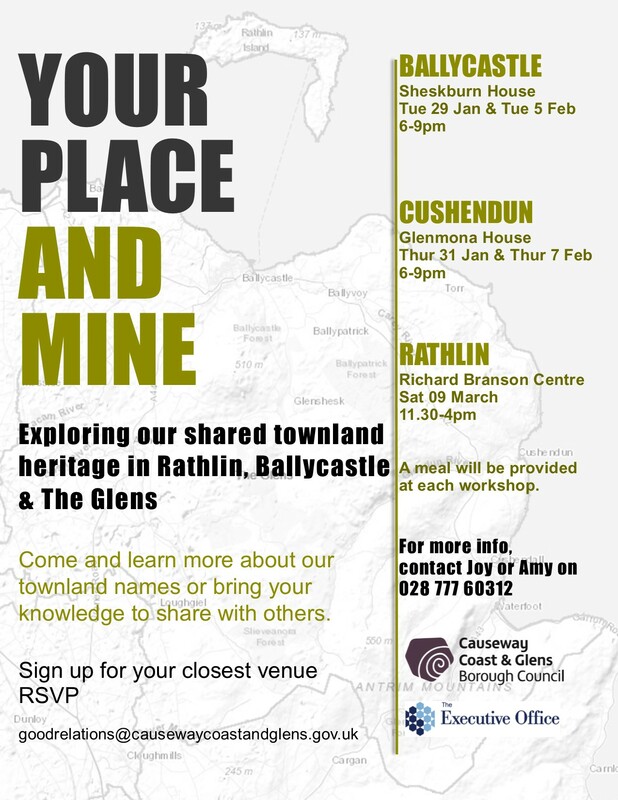 Organised by Causeway Coast and Glens Borough Council’s Good Relations Team, the ‘Your Place and Mine’ workshops will give people the opportunity to learn about townland names and their origin. Facilitated by Gordon McCoy, Pat McKay and Kay Muhr, the workshops will begin with an introduction to the language of place names, the local dialect and how language is linked to the locations. Participants will have the chance to explore Ordnance survey memoirs, discover local historical facts and share stories and information. Workshops will be hosted in Ballycastle (Sheskburn House, January 29th and Feb 5th, 6pm - 9pm); Cushendun (Glenmona House, January 31st and February 7th, 6pm - 9pm) and Rathlin Island (Richard Branson Centre, March 9th, 11.30pm - 4pm) with a meal also included. To register please RVSP to goodrelations@causewaycoastandglens.gov.uk or call 028 7776 0312 for more information.